ONE evening there came into his soul the desire to fashion an image of The Pleasure that Abideth for a Moment. And he went forth into the world to look for bronze. For he could think only in bronze. He went in quietly, locking the door behind him, as was his custom, and dragged the purple hanging from the portrait. A cry of pain and indignation broke from him. He could see no change, save that in the eyes there was a look of cunning and in the mouth the curved wrinkle of the hypocrite. The thing was still loathsome—more loathsome, if possible, than before—and the scarlet dew that spotted the hand seemed brighter, and more like blood newly spilled. Then he trembled. Had it been merely vanity that had made him do his one good deed? Or the desire for a new sensation, as Lord Henry had hinted, with his mocking laugh? Or that passion to act a part that sometimes makes us do things finer than we are ourselves? Or, perhaps, all these? And why was the red stain larger than it had been? It seemed to have crept like a horrible disease over the wrinkled fingers. There was blood on the painted feet, as though the thing had dripped—blood even on the hand that had not held the knife. Confess? Did it mean that he was to confess? To give himself up and be put to death? He laughed. He felt that the idea was monstrous. Besides, even if he did confess, who would believe him? There was no trace of the murdered man anywhere. Everything belonging to him had been destroyed. He himself had burned what had been below-stairs. The world would simply say that he was mad. They would shut him up if he persisted in his story. . . . Yet it was his duty to confess, to suffer public shame, and to make public atonement. There was a God who called upon men to tell their sins to earth as well as to heaven. Nothing that he could do would cleanse him till he had told his own sin. His sin? He shrugged his shoulders. 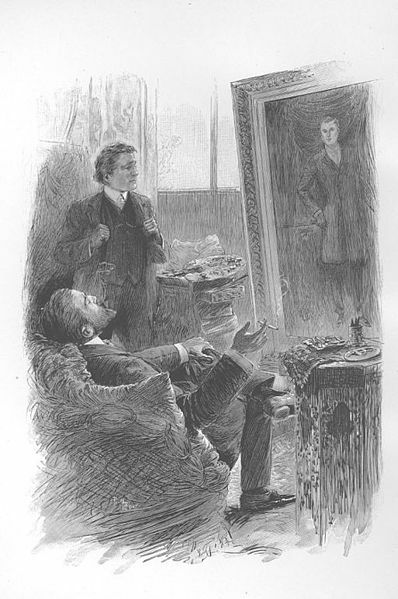 The death of Basil Hallward seemed very little to him. He was thinking of Hetty Merton. For it was an unjust mirror, this mirror of his soul that he was looking at. Vanity? Curiosity? Hypocrisy? Had there been nothing more in his renunciation than that? There had been something more. At least he thought so. But who could tell? . . . No. There had been nothing more. Through vanity he had spared her. In hypocrisy he had worn the mask of goodness. For curiosity’s sake he had tried the denial of self. He recognised that now. But this murder—was it to dog him all his life? Was he always to be burdened by his past? Was he really to confess? Never. There was only one bit of evidence left against him. The picture itself—that was evidence. He would destroy it. Why had he kept it so long? Once it had given him pleasure to watch it changing and growing old. Of late he had felt no such pleasure. It had kept him awake at night. When he had been away, he had been filled with terror lest other eyes should look upon it. It had brought melancholy across his passions. Its mere memory had marred many moments of joy. It had been like conscience to him. Yes, it had been conscience. He would destroy it. When they entered, they found hanging upon the wall a splendid portrait of their master as they had last seen him, in all the wonder of his exquisite youth and beauty. Lying on the floor was a dead man, in evening dress, with a knife in his heart. He was withered, wrinkled, and loathsome of visage. It was not till they had examined the rings that they recognised who it was. Image: Eugene Dété (engraver, d. 1922) after Paul Thiriat (fl. c. 1900–1918). 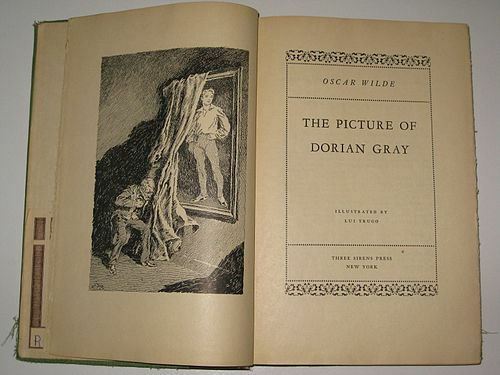 Wood-engraved illustration, frontispiece to The Picture of Dorian Gray, published 1908, London or Paris. — The tragic emotion, in fact, is a face looking two ways, towards terror and towards pity, both of which are phases of it. You see I use the word arrest. I mean that the tragic emotion is static. Or rather the dramatic emotion is. The feelings excited by improper art are kinetic, desire or loathing. Desire urges us to possess, to go to something; loathing urges us to abandon, to go from something. The arts which excite them, pornographical or didactic, are therefore improper arts. The esthetic emotion (I used the general term) is therefore static. The mind is arrested and raised above desire and loathing. — You say that art must not excite desire, said Lynch. I told you that one day I wrote my name in pencil on the backside of the Venus of Praxiteles in the Museum. Was that not desire? — I speak of normal natures, said Stephen. You also told me that when you were a boy in that charming carmelite school you ate pieces of dried cowdung. Lynch broke again into a whinny of laughter and again rubbed both his hands over his groins but without taking them from his pockets. — O, I did! I did! he cried. Stephen turned towards his companion and looked at him for a moment boldly in the eyes. Lynch, recovering from his laughter, answered his look from his humbled eyes. The long slender flattened skull beneath the long pointed cap brought before Stephen’s mind the image of a hooded reptile. The eyes, too, were reptile-like in glint and gaze. Yet at that instant, humbled and alert in their look, they were lit by one tiny human point, the window of a shrivelled soul, poignant and self-embittered. — As for that, Stephen said in polite parenthesis, we are all animals. I also am an animal. — You are, said Lynch. — But we are just now in a mental world, Stephen continued. The desire and loathing excited by improper esthetic means are really not esthetic emotions not only because they are kinetic in character but also because they are not more than physical. Our flesh shrinks from what it dreads and responds to the stimulus of what it desires by a purely reflex action of the nervous system. Our eyelid closes before we are aware that the fly is about to enter our eye. — Not always, said Lynch critically. — In the same way, said Stephen, your flesh responded to the stimulus of a naked statue, but it was, I say, simply a reflex action of the nerves. Beauty expressed by the artist cannot awaken in us an emotion which is kinetic or a sensation which is purely physical. It awakens, or ought to awaken, or induces, or ought to induce, an esthetic stasis, an ideal pity or an ideal terror, a stasis called forth, prolonged, and at last dissolved by what I call the rhythm of beauty. — What is that exactly? asked Lynch. — Rhythm, said Stephen, is the first formal esthetic relation of part to part in any esthetic whole or of an esthetic whole to its part or parts or of any part to the esthetic whole of which it is a part. — If that is rhythm, said Lynch, let me hear what you call beauty; and, please remember, though I did eat a cake of cowdung once, that I admire only beauty. Stephen raised his cap as if in greeting. Then, blushing slightly, he laid his hand on Lynch’s thick tweed sleeve. –We are right, he said, and the others are wrong. To speak of these things and to try to understand their nature and, having understood it, to try slowly and humbly and constantly to express, to press out again, from the gross earth or what it brings forth, from sound and shape and colour which are the prison gates of our soul, an image of the beauty we have come to understand – that is art. They had reached the canal bridge and, turning from their course, went on by the trees. A crude grey light, mirrored in the sluggish water and a smell of wet branches over their heads seemed to war against the course of Stephen’s thought. — But you have not answered my question, said Lynch. What is art? What is the beauty it expresses? — That was the first definition I gave you, you sleepy-headed wretch, said Stephen, when I began to try to think out the matter for myself. Do you remember the night? Cranly lost his temper and began to talk about Wicklow bacon. — I remember, said Lynch. He told us about them flaming fat devils of pigs. — Art, said Stephen, is the human disposition of sensible or intelligible matter for an esthetic end. You remember the pigs and forget that. You are a distressing pair, you and Cranly. — If I am to listen to your esthetic philosophy give me at least another cigarette. I don’t care about it. I don’t even care about women. Damn you and damn everything. I want a job of five hundred a year. You can’t get me one. — Aquinas, said Stephen, says that is beautiful the apprehension of which pleases. — I remember that, he said, Pulcra sunt quae visa placent. – He uses the word visa, said Stephen, to cover esthetic apprehensions of all kinds, whether through sight or hearing or through any other avenue of apprehension. This word, though it is vague, is clear enough to keep away good and evil which excite desire and loathing. It means certainly a stasis and not a kinesis. How about the true? It produces also a stasis of the mind. You would not write your name in pencil across the hypotenuse of a right-angled triangle. — No, said Lynch, give me the hypotenuse of the Venus of Praxiteles. — Static therefore, said Stephen. Plato, I believe, said that beauty is the splendour of truth. I don’t think that it has a meaning, but the true and the beautiful are akin. Truth is beheld by the intellect which is appeased by the most satisfying relations of the intelligible; beauty is beheld by the imagination which is appeased by the most satisfying relations of the sensible. The first step in the direction of truth is to understand the frame and scope of the intellect itself, to comprehend the act itself of intellection. Aristotle’s entire system of philosophy rests upon his book of psychology and that, I think, rests on his statement that the same attribute cannot at the same time and in the same connexion belong to and not belong to the same subject. The first step in the direction of beauty is to understand the frame and scope of the imagination, to comprehend the act itself of esthetic apprehension. Is that clear? — But what is beauty? asked Lynch impatiently. Out with another definition. Something we see and like! Is that the best you and Aquinas can do? — Let us take woman, said Stephen. — Let us take her! said Lynch fervently. — The Greek, the Turk, the Chinese, the Copt, the Hottentot, said Stephen, all admire a different type of female beauty. That seems to be a maze out of which we cannot escape. I see, however, two ways out. One is this hypothesis: that every physical quality admired by men in women is in direct connexion with the manifold functions of women for the propagation of the species. It may be so. The world, it seems, is drearier than even you, Lynch, imagined. For my part I dislike that way out. It leads to eugenics rather than to esthetic. It leads you out of the maze into a new gaudy lecture-room where MacCann, with one hand on The Orion of Species and the other hand on the new testament, tells you that you admired the great flanks of Venus because you felt that she would bear you burly offspring and admired her great breasts because you felt that she would give good milk to her children and yours. — Then MacCann is a sulphur-yellow liar, said Lynch energetically. — There remains another way out, said Stephen, laughing. — To wit? said Lynch. — This hypothesis, Stephen began. A long dray laden with old iron came round the corner of Sir Patrick Dun’s hospital covering the end of Stephen’s speech with the harsh roar of jangled and rattling metal. Lynch closed his ears and gave out oath after oath till the dray had passed. Then he turned on his heel rudely. Stephen turned also and waited for a few moments till his companion’s ill-humour had had its vent. — This hypothesis, Stephen repeated, is the other way out: that, though the same object may not seem beautiful to all people, all people who admire a beautiful object find in it certain relations which satisfy and coincide with the stages themselves of all esthetic apprehension. These relations of the sensible, visible to you through one form and to me through another, must be therefore the necessary qualities of beauty. Now, we can return to our old friend saint Thomas for another pennyworth of wisdom. — It amuses me vastly, he said, to hear you quoting him time after time like a jolly round friar. Are you laughing in your sleeve? — MacAlister, answered Stephen, would call my esthetic theory applied Aquinas. So far as this side of esthetic philosophy extends, Aquinas will carry me all along the line. When we come to the phenomena of artistic conception, artistic gestation, and artistic reproduction I require a new terminology and a new personal experience. — Of course, said Lynch. After all Aquinas, in spite of his intellect, was exactly a good round friar. But you will tell me about the new personal experience and new terminology some other day. Hurry up and finish the first part. — Who knows? said Stephen, smiling. Perhaps Aquinas would understand me better than you. He was a poet himself. He wrote a hymn for Maundy Thursday. It begins with the words Pange lingua gloriosi. They say it is the highest glory of the hymnal. It is an intricate and soothing hymn. I like it; but there is no hymn that can be put beside that mournful and majestic processional song, the Vexilla Regis of Venantius Fortunatus. — That’s great! he said, well pleased. Great music! They turned into Lower Mount Street. A few steps from the corner a fat young man, wearing a silk neckcloth, saluted them and stopped. — Did you hear the results of the exams? he asked. Griffin was plucked. Halpin and O’Flynn are through the home civil. Moonan got fifth place in the Indian. O’Shaughnessy got fourteenth. The Irish fellows in Clark’s gave them a feed last night. They all ate curry. His pallid bloated face expressed benevolent malice and, as he had advanced through his tidings of success, his small fat-encircled eyes vanished out of sight and his weak wheezing voice out of hearing. In reply to a question of Stephen’s his eyes and his voice came forth again from their lurking-places. 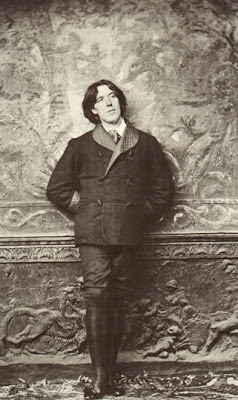 — Yes, MacCullagh and I; he said. He’s taking pure mathematics and I’m taking constitutional history. There are twenty subjects. I’m taking botany too. You know I’m a member of the field club. He drew back from the other two in a stately fashion and placed a plump woollen-gloved hand on his breast from which muttered wheezing laughter at once broke forth. — Bring us a few turnips and onions the next time you go out, said Stephen drily, to make a stew. — We are all highly respectable people in the field club. Last Saturday we went out to Glenmalure, seven of us. — With women, Donovan? said Lynch. — I hear you are writing some essays about esthetics. Stephen made a vague gesture of denial. — Goethe and Lessing, said Donovan, have written a lot on that subject, the classical school and the romantic school and all that. The Laocoon interested me very much when I read it. Of course it is idealistic, German, ultra-profound. — I must go, he said softly and benevolently, I have a strong suspicion, amounting almost to a conviction, that my sister intended to make pancakes today for the dinner of the Donovan family. — Goodbye, Stephen said in his wake. Don’t forget the turnips for me and my mate. — To think that that yellow pancake-eating excrement can get a good job, he said at length, and I have to smoke cheap cigarettes! They turned their faces towards Merrion Square and went for a little in silence. — To finish what I was saying about beauty, said Stephen, the most satisfying relations of the sensible must therefore correspond to the necessary phases of artistic apprehension. Find these and you find the qualities of universal beauty. Aquinas says: Ad pulcritudinem tria requiruntur integritas, consonantia, claritas. I translate it so: Three things are needed for beauty, wholeness, harmony, and radiance. Do these correspond to the phases of apprehension? Are you following? — Of course, I am, said Lynch. If you think I have an excrementitious intelligence run after Donovan and ask him to listen to you. — Look at that basket, he said. — I see it, said Lynch. — In order to see that basket, said Stephen, your mind first of all separates the basket from the rest of the visible universe which is not the basket. The first phase of apprehension is a bounding line drawn about the object to be apprehended. An esthetic image is presented to us either in space or in time. What is audible is presented in time, what is visible is presented in space. But, temporal or spatial, the esthetic image is first luminously apprehended as selfbounded and selfcontained upon the immeasurable background of space or time which is not it. You apprehended it as one thing. You see it as one whole. You apprehend its wholeness. That is integritas. — Bull’s eye! said Lynch, laughing. Go on. — Then, said Stephen, you pass from point to point, led by its formal lines; you apprehend it as balanced part against part within its limits; you feel the rhythm of its structure. In other words, the synthesis of immediate perception is followed by the analysis of apprehension. Having first felt that it is one thing you feel now that it is a thing. You apprehend it as complex, multiple, divisible, separable, made up of its parts, the result of its parts and their sum, harmonious. That is consonantia. — Bull’s eye again! said Lynch wittily. Tell me now what is claritas and you win the cigar. — The connotation of the word, Stephen said, is rather vague. Aquinas uses a term which seems to be inexact. It baffled me for a long time. It would lead you to believe that he had in mind symbolism or idealism, the supreme quality of beauty being a light from some other world, the idea of which the matter is but the shadow, the reality of which it is but the symbol. I thought he might mean that claritas is the artistic discovery and representation of the divine purpose in anything or a force of generalization which would make the esthetic image a’ universal one, make it outshine its proper conditions. But that is literary talk. I understand it so. When you have apprehended that basket as one thing and have then analysed it according to its form and apprehended it as a thing you make the only synthesis which is logically and esthetically permissible. You see that it is that thing which it is and no other thing. The radiance of which he speaks in the scholastic quidditas, the whatness of a thing. This supreme quality is felt by the artist when the esthetic image is first conceived in his imagination. The mind in that mysterious instant Shelley likened beautifully to a fading coal. The instant wherein that supreme quality of beauty, the clear radiance of the esthetic image, is apprehended luminously by the mind which has been arrested by its wholeness and fascinated by its harmony is the luminous silent stasis of esthetic pleasure, a spiritual state very like to that cardiac condition which the Italian physiologist Luigi Galvani, using a phrase almost as beautiful as Shelley’s, called the enchantment of the heart. Stephen paused and, though his companion did not speak, felt that his words had called up around them a thought-enchanted silence. — What I have said, he began again, refers to beauty in the wider sense of the word, in the sense which the word has in the literary tradition. In the marketplace it has another sense. When we speak of beauty in the second sense of the term our judgement is influenced in the first place by the art itself and by the form of that art. The image, it is clear, must be set between the mind or senses of the artist himself and the mind or senses of others. If you bear this in memory you will see that art necessarily divides itself into three forms progressing from one to the next. These forms are: the lyrical form, the form wherein the artist presents his image in immediate relation to himself; the epical form, the form wherein he presents his image in mediate relation to himself and to others; the dramatic form, the form wherein he presents his image in immediate relation to others. — That you told me a few nights ago, said Lynch, and we began the famous discussion. — I have a book at home, said Stephen, in which I have written down questions which are more amusing than yours were. In finding the answers to them I found the theory of esthetic which I am trying to explain. Here are some questions I set myself: Is a chair finely made tragic or comic? Is the portrait of Mona Lisa good if I desire to see it? If not, why not? — Why not, indeed? said Lynch, laughing. — If a man hacking in fury at a block of wood, Stephen continued, make there an image of a cow, is that image a work of art? If not, why not? — That’s a lovely one, said Lynch, laughing again. That has the true scholastic stink. — Lessing, said Stephen, should not have taken a group of statues to write of. The art, being inferior, does not present the forms I spoke of distinguished clearly one from another. Even in literature, the highest and most spiritual art, the forms are often confused. The lyrical form is in fact the simplest verbal vesture of an instant of emotion a rhythmical cry such as ages ago cheered on the man who pulled at the oar or dragged stones up a slope. He who utters it is more conscious of the instant of emotion than of himself as feeling emotion. The simplest epical form is seen emerging out of lyrical literature when the artist prolongs and broods upon himself as the centre of an epical event and this form progresses till the centre of emotional gravity is equidistant from the artist himself and from others. The narrative is no longer purely personal. The personality of the artist passes into the narration itself, flowing round and round the persons and the action like a vital sea. This progress you will see easily in that old English ballad Turpin Hero which begins in the first person and ends in the third person. The dramatic form is reached when the vitality which has flowed and eddied round each person fills every person with such vital force that he or she assumes a proper and intangible esthetic life. The personality of the artist, at first a cry or a cadence or a mood and then a fluid and lambent narrative, finally refines itself out of existence, impersonalizes itself, so to speak. The esthetic image in the dramatic form is life purified in and reprojected from the human imagination. The mystery of esthetic, like that of material creation, is accomplished. The artist, like the God of creation, remains within or behind or beyond or above his handiwork, invisible, refined out of existence, indifferent, paring his fingernails. — Trying to refine them also out of existence, said Lynch. His downcast eyes followed the silent veining of the oaken slab. Beauty: it curves, curves are beauty. 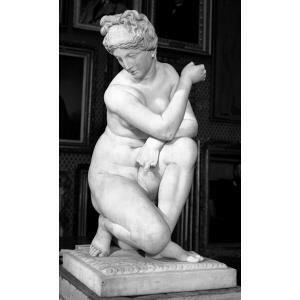 Shapely goddesses, Venus, Juno: curves the world admires. Can see them library museum standing in the round hall, naked goddesses. Aids to digestion. They don’t care what man looks. All to see. Never speaking, I mean to say to fellows like Flynn. Suppose she did Pygmalion and Galatea what would she say first? Mortal! Put you in your proper place. Quaffing nectar at mess with gods, golden dishes, all ambrosial. Not like a tanner lunch we have, boiled mutton, carrots and turnips, bottle of Allsop. Nectar, imagine it drinking electricity: gods’ food. Lovely forms of woman sculped Junonian. Immortal lovely. And we stuffing food in one hole and out behind: food, chyle, blood, dung, earth, food: have to feed it like stoking an engine. They have no. Never looked. I’ll look today. Keeper won’t see. Bend down let something fall see if she.